Hi everyone! 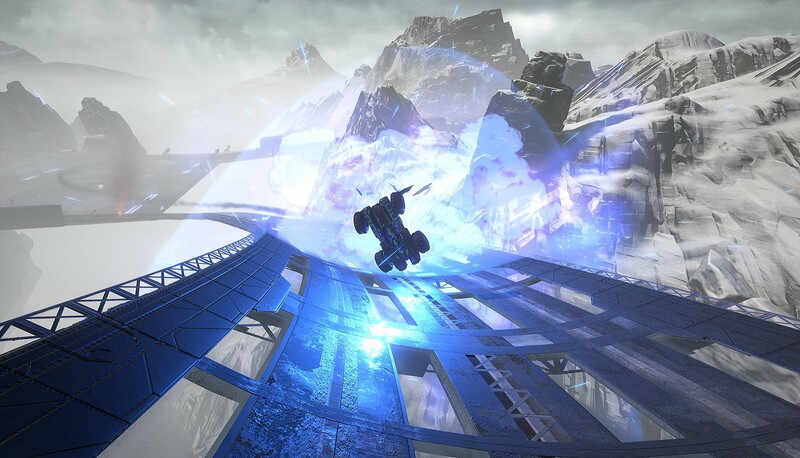 After starting work on Grip: Combat Racing back in 2014, we’re really excited to share today, after all this time, that Grip will be released on PS4 on November 6. As the principal programmer on Grip: Combat Racing, I’m responsible for producing all of the code for the game. It’s been a painstaking development process with difficult problems to solve. 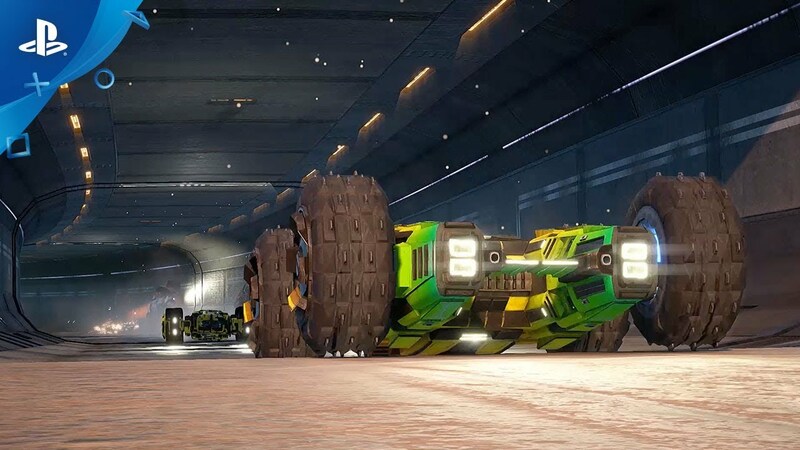 Making a game that pits vehicles against each other at over 700 mph is a challenge even with cars that keep their wheels firmly on the road… but in Grip you can drive on walls, ceilings or anything else you can get your tires to. Below are three of the biggest challenges we’ve faced and how we’ve overcome them. Downforce, or the downward thrust created by the aerodynamic characteristics of a car, is a huge factor in making Grip’s signature gameplay a reality. All of the vehicle physics in the game is custom code written by us. A realistic vehicle simply wouldn’t be drivable at the speeds we’re dealing with, so we’ve had to do a huge amount of work to create a fun, playable game that was still a believable and engaging driving experience. Your downforce or Grip in the game is related to speed but disregards the shape and aerodynamics of the vehicle. One thing we learned very early is that predictable handling was really important, so we’ve tried to disregard aerodynamics in favor of better vehicle handling when possible. This simple calculation is then scaled even further by the vehicle’s orientation to walls or ceilings, with ceilings providing the most grip – enough to overcome gravity. It was important not to use too much downforce all of the time, and rather the right amount at the right moment, because the more the suspension springs are compressed the more unwieldy the vehicle handling becomes. We’ve put a lot of time into balancing the gameplay in Grip, having worked on several combat racers in years gone by, including Rollcage (a title from which Grip draws inspiration). I’m all too familiar with getting hit and left behind on the start line. There are nine power-ups within the game, each of which has been carefully considered and balanced to be devastating but not race-ending, from exploding darts to Hydra missile systems. 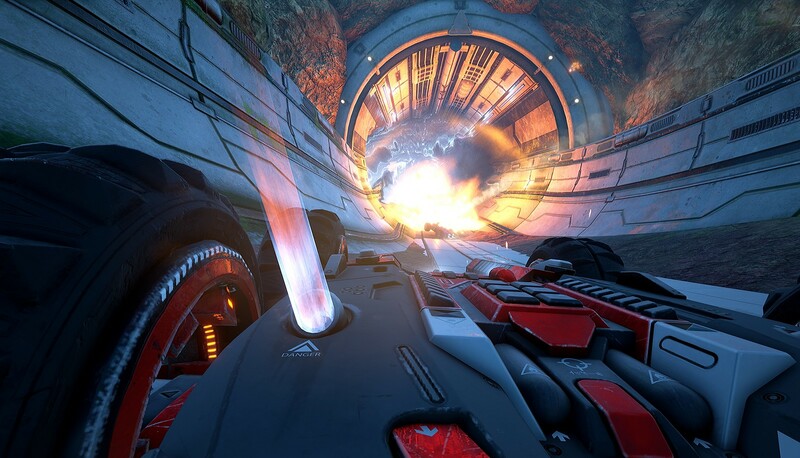 The game offers great variety and even the ability for savvy racers to super-charge their arsenal and deliver a race-changing blow. On top of the weapons system, the three vehicle classes have been carefully balanced and we’ve implemented a system we call catch-up assist. This is a configurable race option which goes beyond just rubber-banding the AI. Catch-up assist subtly changes the forces on the vehicles based on position, helping to keep the racing pack tight for maximum carnage. If you’re a fan of the purely balanced experience this can be switched off (and even used to filter for online games), but for us this gets left on for maximum fun. Working as a satellite studio has definitely made for an interesting game development cycle, with level designers, programmers, artists and other project team members individually spread around the world. I myself am based in remote Indonesia, working off local power generators and almost entirely over a 4G connection, with the waves lashing in around us. We’ve seen practically everything including whole island power cuts, but we’ve always kept focused. We’ve had to work hard to bring the team together, and even harder to keep development running smoothly. The game has been created in Unreal Engine 4, a massive departure from native programming for the original PlayStation. This alongside PhysX has enabled us to create what we hope you’ll agree is a stunning game, taking full advantage of the PS4 and PS4 Pro. We’re entering the final stages of development, but we’re pleased to confirm that the game will support HDR on both platforms along with a number of other optimizations for PS4 Pro – with a target of 60fps gameplay for launch. Not sure this is gonna stick with US audience, UK is more attracted to jungle in comparison. Also, this jungle dnb doesn’t fit the trailer. Please tell us it has four player split-screen? A very important feature all the major racing games seem to forget about. Thanks Cusman. Good news! I’m at work so I read the article, but didn’t watch the video. My bad. Where do I pre-order? This game looks incredible! Great job! I’ve been looking for another arcade racer to get into after finishing Redout and Mantis Burn Racing and this looks right up my alley. If you guys can, make sure to add a platinum trophy. We really like that on PlayStation. Regardless though I’m looking forward to playing this. I’ve played it off and on (mostly off, as I’ve been distracted) during development, but every time I fire it up it brings a smile to my face. Looking forward to the finished, polished experience – will certainly pick it up on PS4! Please, please tell me it supports local multiplayer? A lot of us are looking for something that nothing since Blur has managed! Oh! It DOES have split-screen!! Brilliant! Launch all zone or only zone 1 ?